Has Facebook become The Social Evil Network? Facebook may have taken us down new paths towards finding other ways to upset one another. As if Life isn’t fraught enough with misunderstandings, we now have cyber ways to create even bigger slights and more methods to upset one another. I don’t know about you but, I’ve been finding that going onto Facebook can be an act of “do so at your own peril” activity. 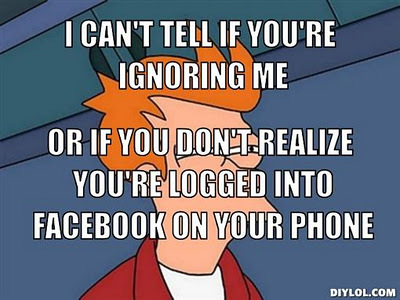 In spite of talking to people regularly in person, I often end up finding out something about someone over Facebook and wish that I hadn’t have seen it. I’m at the point now of figuring that ignorance is bliss and what we don’t know can’t hurt us. Sometimes, we’re just better off not knowing. It saves a lot of heartache and headaches at times. I’m no Spring Chicken and didn’t just fall off the turnip truck. I’ve been around the block and back a number of times throughout my life and yet, I can still find myself ticked off and hurt by something someone’s done or said on Facebook. It’s feeling more like I’m back in elementary or highschool. I guess, in some ways, that might be a good thing but, in other ways, it’s feeling more like a backwards slide in Life. Afterall, at a certain point, we’re supposed to have grown mentally and emotionally to a level where we’re overlooking these types of things and letting them roll off of our backs with a mature attitude, right? I recently found out some great news about a friend via a posting she’d made on Facebook. I was thrilled for this friend and her family. Quickly, I typed in a congratulatory note then, asked myself what I was doing in just writing to her and picked up the phone to give my sentiments of glee to her in person. Just yesterday, I found another friend with similar news having been posted on Facebook and did the same thing. Then, it dawned on me that I had been speaking with both of these people all along but, there had been not a word from them about their news during our conversations. Not only that but, instead of having picked up the phone to tell me in person, as good friends often do, they both had simply posted their news on Facebook and I’d gotten their good news at the same time as others did who have seemingly no contact with each other except for Facebook. They don’t even know one another in person and have never met. That was a kick in the rear to realize that fact when I did realize it. However, it didn’t stop there. Both of these friends had been calling or visiting me with their “problems” all along. I’d literally spent hour upon hour, listening and trying to help out in whatever ways that I could help them and yet, when it came to the good news,apparently, I was on the same ranks as everyone else, including pretty much strangers. What an awakening that was. To add insult to injury, it became apparent that other people on their Facebook Friends List had known about this joyful news months prior. Their posts of, “I was so happy for you when you told me about this a few months ago…” hit me square in the face. It was at that point that I wanted to re-dial both of them and give them a good piece of my mind, telling them to not bother calling me again when they had problems as they could call “Jane or Jack” instead. I found myself boiling over with feelings of anger, hurt, frustration along with an overwhelming sense of having been used and abused by them all along. I wondered why I was “good enough” for the bad times but, not on equal footing with the good times. Was I the opposite of a “Fair Weather Friend”, only there when they need a shoulder to cry on but, not deserving of having the good times shared? Suddenly, I was transported back to being a kid in a playground where others were sharing secrets that I wasn’t allowed to be privy to and, feeling like the outcast/outsider. All of the old feelings of rejection and clicks came flooding back. The sense of being the pariah was as fresh at this point as they were back then and I had a few miserable days and evenings, pouting over and licking these fresh wounds, just as I would have done way back then. Yesterday, as I was thinking about all of this emotional turmoil I was feeling, I suddenly began to remember having been a “go-between” for two other friends who had developed a total misunderstanding over a stupid technical glitch in Facebook where one friend has seemingly restricted view for the other. Knowing both, I wasn’t convinced that this was a purposeful slight so, I set about to do some detective work to figure it out. In the end, it turned out that I had been right. There was no slight or rejection but, rather a technical glitch and all was righted within a day or two. However, the damage that was done through school-yard hurts was fairly significant. The “rejected one” was certain that she had been ousted by the other and didn’t understand why. Instead of thinking about it more fully and picking up the phone to call the other where the air would have been cleared instantly and all of the hurt, avoided, she’d sat back as I was doing with these incidents, brooding, fretting, crying and feeling totally like yesterday’s garbage. Have I solved all of my issues with these two friends of mine quite as easily? No, I haven’t yet come to that point. I have though, realized that Facebook can be a source of trouble between people if they don’t confront it head on, person to person. I intend on finding a calm way to approach this with these two friends. I think I need to have a friendly, open dialogue with both, asking for their sides of the story rather than ignoring this and letting it become an acid that simply eats away at me. The issue of being talked to about the bad or troublesome issues and not let in on the good, needs somehow, to be addressed on a mature level. At the least, I’ve come to realize that even though we are grown-ups, the old and primal feelings of hurt can still very much be alive and well and child-like as they once were. The only difference is how we deal with it all internally and externally. Sometimes, ignorance is bliss but, these incidents have reminded me that we never outgrow being hurt or feeling rejection and that Facebook can take us back to a school aged level if we’re not careful. It seems that it can turn us back into the giggling, snotty, emotionally immature little freaks we might have been or hung out with while in school. Be careful of what you post on Facebook. If you don’t want to hurt anyone’s feelings, make sure that what you post is thoughtful and respectful to all. Afterall, it’s really just another playground where hurts can happen and none of us are totally grown up in that aspect.